Jesus ascended to his throne, taking possession of his kingdom prepared from the foundation of the world. In the meantime we who are children of the kingdom must be good stewards of all that the King has entrusted to us. We will be judged by the fruit that is produced from our investment in the kingdom. When Jesus returns for the final judgment we will give an accounting of our work. What did we do with what we were given? 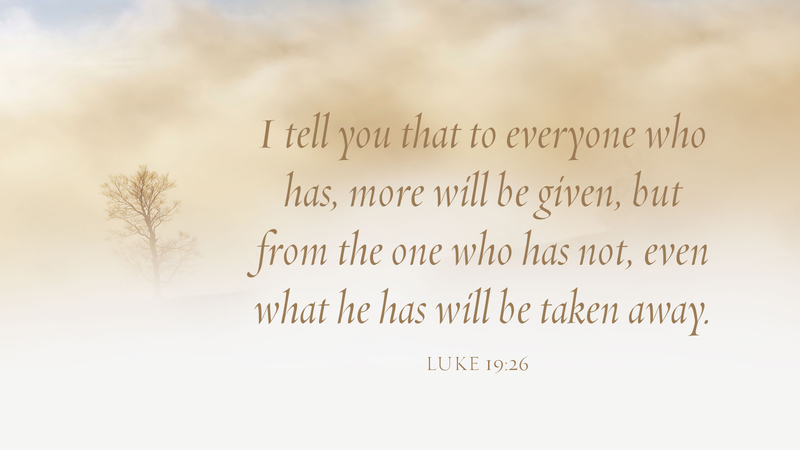 Jesus does not give us anything just so we ourselves can enjoy it. He gives it so we may live as partners with him and each other, to share and enjoy together what he has given. We should not live in fear of his judgment, so afraid that we simply hold on to what he has given. Again, it is not ours to have, but to use to be blessed and to bless others. How much fruit must be produced? The parable says the nobleman would have accepted a little interest on his money. It is not how much fruit; it is that some fruit must be produced. Stop worrying about how much, and just get back to work. Prayer: Lord, help us to be good stewards of all your gifts and be ready to praise you for the produce when you return. Amen.